A vital part of customer relationship management is opportunity management. It is through this important cog in SAP CRM that you’ll be able to control all sales process. What’s more, you’ll be able to use all the techniques available through opportunity management in CRM Mobile, the Interaction Center, and Partner Channel Management. From an enterprise point of view, opportunity management can be defined as a recognized possibility, for example, an opportunity arising out of sales of services or products. From where can these opportunities arise? They can arise from different sources like a bid invitation, a sales deal, and a trade fair.In this tutorial you will get an idea about SAP CRM Opportunity management. At the end of this article you can refer its configuration guide in PDF. SAP CRM professionals can use opportunity management in describing their sales prospects. For example, it can be used for identifying the requested services and products, the budget of sales prospects’, the potential sales volume, and the probability of profits that can arise out of sales. It is information like this that gets used throughout the sales cycle and gets evaluated constantly. An intuitive framework can be established through opportunity management that can help define the nature of sales projects from the beginning and even have them tracked at various stages of the sales cycle. Thanks to this approach, it is possible to analyze and optimize the performance of an enterprise. 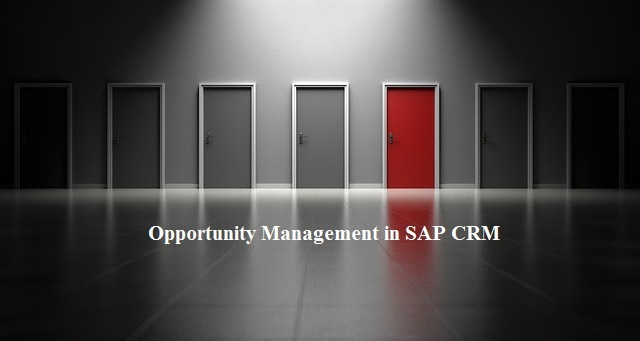 Why using opportunity management in SAP CRM is recommended? With so many sales representatives working for you round-the-clock, opportunity management helps keep track of them and their activities and performances all the time. Distribution of large sales order can be expected at enterprise level regularly. Therefore, in using opportunity management in SAP CRM, a lot of work can be simplified and efficiency can be guaranteed. Most sales cycles span a long period of time. It is here that opportunity management can come to your rescue in checking the progress of the sales flow at any stage or anytime. Another remarkable feature of opportunity management in SAP CRM is that it lets you construct a sales methodology that can match your sales processes comfortably. What’s more, your sales professionals can be coaches using various steps available in opportunity management from identifying a lead to closing the sale. There’s also an option to insert documents using opportunity management in SAP CRM. For example, if you have received product presentations then that can be added, along with materials or correspondences like building plans, sketches, and so on. This is where you can use Integrated Content Management too! Sources of Opportunity – In this category, you’ll be able to define all sources of opportunities that arise in a sales cycle. Here, you can indicate the sales volume that arises from specific categories like bid invitation, trade fair, etc. Opportunity Group – Grouping of opportunities can be achieved through this category. For example, a separate group can be defined for existing or new customers. Establishing Priority – Assuming that a probability has the potential to be converted to a lead then you can define the priority as well. It is easy to set the sources of opportunity, opportunity group, and establish priority in SAP CRM. All you need to do is select ‘IMG’ option under ‘SPRO’. Then, select ‘Transactions’ under ‘Customer Relationship Management’, followed by ‘Setting for Opportunities’ and ‘Define Opportunity Group, Priority, and Origin’. Next refer the pdf guide about how to the configuration settings for SAP CRM opportunity management.